I want to draw everyone's attention to the March/April issue of Diabolique, which features an in-depth interview with Mike Flanagan, director of Absentia (2011) and the upcoming Oculus (2014). which stars Karen Gillan. The advance reviews for Oculus have been positive, and I'm very excited to see this movie come April 11. Similarly, Absentia is a real micro-budget treasure, and deeply disturbing (in the way that good horror always should be.) My review of that film is here. In "Safety Not Guaranteed" interviewer Chris Hallock does a meticulous job of taking us beneath the surface of Flanagan's impressive work. The informative interview gives us a good idea of what makes Flanagan tick as an artist. We learn about his obsessions with family, and how his latest work is a sort of cathartic exercise after an upsetting experience in his own life. We also get some details of a future project called Somnia. 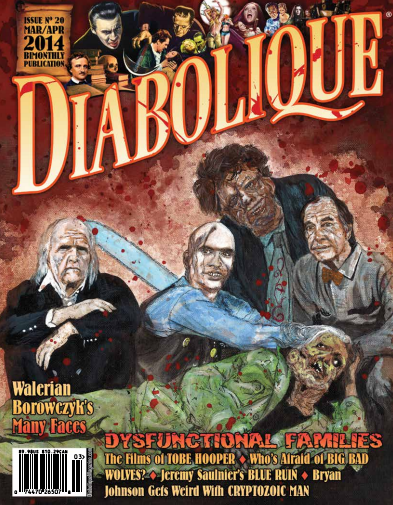 I should also point out that this issue of Diabolique also includes an in-depth and worthwhile re-cap of Tobe Hooper's directing career by James Gracey, called "Family Man." I'm a huge Hooper fan, so it is always great to see the man get his due as an artist. He's underrated to a criminal degree. John, thank you so much for the review and the kind words! Mike's work holds a lot of significance for me, and I'm glad that came through in the interview piece. I could honestly write a book about just these two films. Kudos to the great team at Diabolique who work tirelessly month in and out to put out a high quality, intellectual magazine devoted to the horror genre. Thanks again, my friend!